Want to know the value of your 1940 penny? 1940 pennies turn up every now and then in pocket change, bank rolls, and other places in circulation — so chances are fairly good that you may have a 1940 wheat penny or two in your possession. How much is a 1940 penny worth? How many 1940 pennies were made? 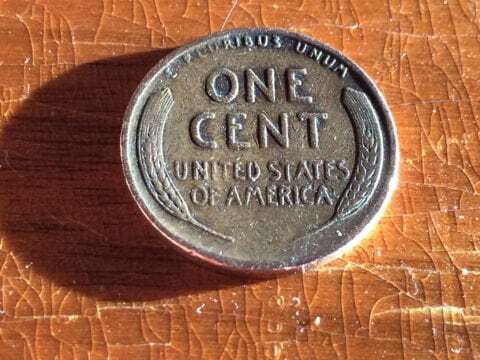 Are 1940 wheat pennies rare? What’s the most valuable 1940 penny? That’s the question so many folks want to know… Probably you, too. The value of a 1940 penny varies, depending on the mintmark of the coin and also its state of preservation. Generally speaking, most 1940 pennies that are found in circulation have moderate to heavy wear. Despite the wear, many 1940 pennies have never been cleaned or have much, if any, damage (holes, bends, heavy nicks, etc). Of course, this is a good thing — because cleaning a coin with the vain attempt of making it look better or altering it to turn it into jewelry or an art project not only causes permanent damage to the coin, but it also lowers its value. *Proof Lincoln wheat pennies from 1940 are generally only found in collections or estates and in decent condition. They virtually never turn up in circulation with wear. The 1940 penny had, for its time, the highest mintage of all pennies. There were also 15,872 proof specimens of the 1940 penny made at the Philadelphia Mint — back then, virtually all proofs were made in Philly, not San Francisco. Since millions upon millions of 1940 pennies were minted, they really aren’t rare in the absolute sense. Even with the loss of so many 1940 pennies over the years through circulation wear, damage, destruction, loss to fire and burial, and so on, there are still tens of millions of 1940 pennies around. So, 1940 wheat pennies are not rare — at least in worn grades. But uncirculated 1940 pennies and proof 1940 pennies are a different story! While there are millions of circulated 1940 pennies around, there are actually only a few dozen thousand that remain in uncirculated and proof condition. In other words, uncirculated and proof 1940 pennies are scarce. Also, the better the condition of an uncirculated or proof 1940 penny, the rarer it is. In grades above Mint State-67, uncirculated 1940 pennies go from being scarce to relatively rare. All proof 1940 pennies with cameo frosting on the devices (Lincoln’s head, the wheat stalks, lettering, etc.) are rare, with perhaps only 100 or so around. What Is The Most Valuable 1940 Penny? According to the Professional Coin Grading Service (PCGS), a 1940 Lincoln penny graded Mint State-68 Red (a nearly perfect coin with original, bright copper-colored surfaces) sold for $14,950 in 2006. Talk about a pretty penny! What Else Happened When Your 1940 Penny Was Made? In Europe, World War II was ramping up, as Germany invaded nations such as Luxembourg, the Netherlands, Belgium, and France. British and other Allied forces responded with counterattacks against the ground invasions and Luftwaffe air assaults. To help spare materials and provisions for the war effort, British civilians were subject to rations of food and other supplies. The United States welcomed Captain America, the patriotic super hero who is seen punching German villain Adolf Hitler on the first cover of the immensely popular, eponymous comic book series. United States President Franklin Delano Roosevelt won reelection to his third term in office after helping lift the nation from the dark days of the Great Depression with his New Deal programs. Roosevelt was later honored on the dime. One of the most important inventions of 1940? Nylon stockings! They hit store shelves at about 20 cents apiece and were monumentally popular from the very beginning. Top songs of 1940 include “I’ll Never Smile Again” by Tommy Dorsey, “Only Forever” by Bing Crosby, and “Frenesi” by Artie Shaw.